Following a 25 year career at the interface between public and private sector, Elizabeth now sits on a range of public, private and third sector Boards as a non-executive. A former Director of CBI Wales, Elizabeth Haywood is a graduate economist from Cardiff University with a PhD (Politics) from Swansea. She speaks French, Spanish and Italian. Following an early career in the European Parliament in Brussels and Luxembourg, and in trade publications in the USA, she gained management experience at the Welsh Development Agency in Cardiff. 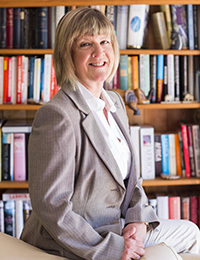 At CBI Wales, she developed senior contacts in a wide range of businesses in Wales and throughout the UK and had a good deal of exposure to the media as the organisation’s spokesperson, which continued in her next role as Communications Director for the Association of Train Operating Companies, ATOC. She joined recruitment firm kmc in 2001 and became Managing Director in 2002, heading first their public sector then the private sector practice. In 2008, she set up The Haywood Hain LLP. In 2012, she was appointed by the Welsh Minister for Business to chair a Task & Finish Group on City Regions, reporting in July the same year. She was named Welsh Woman of the Year in 1994, and has received an Honorary Fellowship from the University of Wales Lampeter for her contribution to business, and an Honorary Doctorate from Swansea University.